When you stay at Margaritaville Beach Hotel in Pensacola Beach, you'll be on the beach, within a 15-minute drive of Pensacola Beach Pier and Pensacola Civic Center. With a stay at Courtyard Pensacola, you'll be centrally located in Pensacola, within a 15-minute drive of Pensacola Civic Center and University of West Florida. Beautiful beaches, an abundance of sunshine and loaded with tons of fun attractions and activities including the National Museum of Naval Aviation, the Pensacola Historic Village and the fantastic Pensacola Museum of Art, Pensacola is an excellent vacation spot for all. Located in northwest Florida, a vacation in this historic beach city will sweep you off your feet. As a top travel destination, Pensacola has an extensive selection of hotels for every need and budget. Whether it’s a pet-friendly hotel in Pensacola or a luxury Pensacola Hotel, you will find everything. Getting the best available Pensacola Hotel deal can be quite tricky and we at MyFlightSearch have partnered with top domestic as well as international hotel chains, so you always get the best Pensacola hotel deals available online. Browse our selection of Cheap Pensacola Hotel rooms and save big on your trip! Pensacola is almost a year-round destination, with something different to offer every season. If you love to party and experience its urban life, visit the city during March and April when the city attracts spring breakers to enjoy its beautiful weather and the many fun activities. Rates of Pensacola hotels and resorts tend to increase around this time. Travelers are highly recommended to make their Pensacola hotel reservations in advance. Visitors looking to save on hotel rooms can always look up for hotels near Pensacola, which are bit cheaper. Looking to enjoy Pensacola as well as save on Pensacola hotel deals? Visit the city during mid-September and October. The weather is pleasant, and this is the time when the town shakes off the spring breakers and the family vacationers. This is also an excellent time to save as Pensacola hotel rooms tend to be cheaper. Travelers will even get to enjoy the comfort of staying in a top Pensacola hotel or a one of a kind Pensacola boutique hotel. Some of the best resorts in Pensacola also offer excellent deals during this time. No visit to Pensacola is complete without a visit to the Naval Air Station Pensacola. Home to the Blue Angels, Fort Barrancas, National Museum of Naval Aviation and Pensacola Lighthouse, Naval Air Station Pensacola serve as a haven for aviation buffs as well as a favorite among family vacationers. Enjoy glimpses of the city’s rich history and its diverse cultural life while exploring the Historic downtown and its many attractions. Visit the T.T. Wentworth Jr. Museum, the Museum of Commerce and the Museum of Industry and enjoy the exhibits display. While you are here, make sure to visit the Old Christ Church built in 1832. Relax and sunbath on the soft sanded beaches. Engage in various action-packed water activities like jet skiing, diving and more. The city is known for its pristine beaches and the endless activities it offer. Located around 15 miles west of downtown Pensacola, Perdido Key serves as a hot spot for travelers seeking for privacy. Home to the Big Lagoon State Recreation Area, Gulf Island National Seashore and the ruins of Fort Mcree, Perdido Key is amazing for a quick day trip. The area is also known for offer cheap hotels for people looking for accommodation near Pensacola. Just an hour drive from Pensacola, Fort Walton Beach offers an abundance of fun activities and attractions for all kind of travelers. It is also home to the famous Billy Bowlegs Festival. A paradise for the adventure seeker, Adventures Unlimited is perfect for canoeing, kayaking, and tubing through the Blackwater River State Forest. Adventures Unlimited is just 12 miles away from Downtown Pensacola. An independent community, this is where some of the best beaches in the area are location. Pensacola Beach is also home to the Fort Pickens Gate Park. The area around the airport is dotted with tons of hotels, making it very convenient for travelers looking for accommodation close to the airport. Close to the downtown area, Bayou Blvd is home to some of the best restaurants in the city including the Chet's Seafood. Not far away from the business district, Perdido Key is an excellent option for travelers looking for cheaper accommodations. A Haven for budget travelers, some of the city’s best Pensacola motels and budget hotels are located here. Just a stone throw away from all the top nightclubs, restaurants and attractions, Downtown Pensacola is for those who want to be close to everything. The area also has an endless selection of hotels, right from budget hotels to mid-range and luxury hotels. Close to the beach, moments away from some of the area’s best nightclubs, it’s not a wonder why Pensacola is a favorite among travelers looking to experience everything the city has to offer. With a wide option of hotels including top hotel chains like the Hilton, you will never run out of accommodations here. The area is also home to some of the best Pensacola resorts hotels as well as budget hotels. 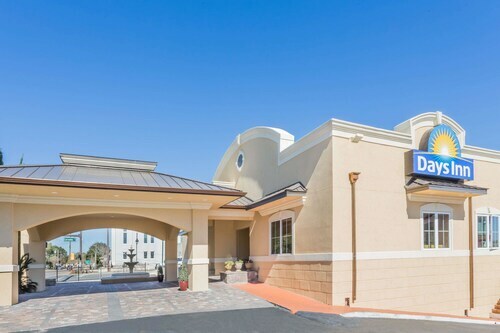 An ideal location for travelers, especially business travelers who are looking to save time on commuting to the airport, the area around Pensacola International Airport offers a wide option of accommodation for every need and budget. The district also has some of the best business hotels equipped with modern amenities. Average cost of a hotel room in Pensacola? An average hotel room cost around $70 per night. The rate depends on the time of your visit. The average cost of a hotel room in Pensacola during the weekend? Weekend rates for hotels in Pensacola cost around $80 to $120 per night. Which are the most popular Pensacola neighborhoods to stay for Business Traveler? Downtown and the Airport area are the most popular neighborhoods to stay for business travelers. How much do you tip a porter at a hotel in Pensacola? Best Time to Book a Hotel in Pensacola? According to many travel experts the best time to book a hotel in Pensacola is 90 to 60 days before your scheduled departure. Pensacola International Airport serves as the ultimate getaway to Pensacola. The airport is served by airlines including American Airlines, Frontier Airlines, United Express and Silver Airway, connects the city to top destinations such as Dallas, Miami, Atlanta, Houston, Kansas City, Chicago and more.